Drinking • The British tradition involves smaller kegs of unique, cask-conditioned beers. 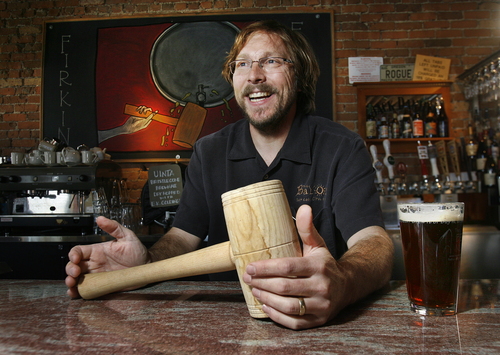 Scott Sommerdorf | The Salt Lake Tribune Bayou owner Mark Alston holds the mallet he used to tap the keg of Uinta Bristlecone Brown Ale that was being poured for Firkin Friday, Friday, October 11, 2013. This British beer tradition involves smaller kegs of cask-conditioned beers that have been supplemented with unique ingredients like fresh hops, coffee or fruit. Scott Sommerdorf | The Salt Lake Tribune The Uinta Bristlecone Brown Ale that was on tap for Firkin Friday at the Bayou, Friday, October 11, 2013. This British beer tradition involves smaller kegs of cask-conditioned beers that have been supplemented with unique ingredients like fresh hops, coffee or fruit. Scott Sommerdorf | The Salt Lake Tribune Clay Turnbow savors a sip of the Uinta Bristlecone Brown Ale that was on tap at the Bayou during "Firkin Friday", Friday October 11, 2013. This British beer tradition involves smaller kegs of cask-conditioned beers that have been supplemented with unique ingredients like fresh hops, coffee or fruit. Scott Sommerdorf | The Salt Lake Tribune Bayou owner Mark Alston taps the keg of Uinta Bristlecone Brown Ale for Firkin Friday at The Bayou, Friday, October 11, 2013. This British beer tradition involves smaller kegs of cask-conditioned beers that have been supplemented with unique ingredients like fresh hops, coffee or fruit. One of the newest trends in Utah beer is really a centuries-old English tradition with an unusual name. We&apos;re talking firkins, the name for a barrel of beer that holds about 9 gallons or one-fourth of a regular barrel. The term comes from the word vierdekijn, which means fourth. More important than a firkin&apos;s size, though, is that it is filled with beer that has not been cold-filtered, pasteurized or carbonated by outside equipment. Because the beer is naturally carbonated in the firkin, it is often called "real ale" or "cask-conditioned" beer. Mark Alston, owner of The Bayou, said firkins are growing in popularity across the U.S. and in Utah because of the unique ingredients that brewers add to the unconditioned beer before the cask is sealed for aging. In England, the tradition is to add dry hops to the brew. But today&apos;s brewers add everything from fresh fruit to chocolate to chipotle peppers, creating a one-of-a-kind beer. It is this "one-off nature of a cask beer" that makes it so exciting, said Alston, who began a weekly Firkin Friday celebration at his Salt Lake City bar in June. Seven local brewers take turns creating specialty brews in a firkin. "It&apos;s fun to try something that if you don&apos;t drink it that day, that&apos;s it, it&apos;s gone and there&apos;s no other opportunity," said Alston, who encourages the Utah brewers to be creative. And they have complied. A few weeks ago, Desert Edge Brewery added cedar and ash wood to its Latter-day Stout, "which gave it a nice licorice flavor," said Alston. Last week, Uinta added the legendary East Kent Golding Hops from the U.K. to its Bristlecone Brown Ale for a more "earthy"-tasting beer. The old-fashioned way a firkin beer is tapped  with a mallet and peg and then a nice spray of beer  is another reason to like the firkin experience, said Alston. After tapping, the keg sits on the bar and is served warmer than other draft beers. The method means the first pint glass of beer tastes different than the last. Clay Turnbow, a home brewer from Salt Lake City, stops by The Bayou whenever he can to sample what&apos;s inside the new firkin. 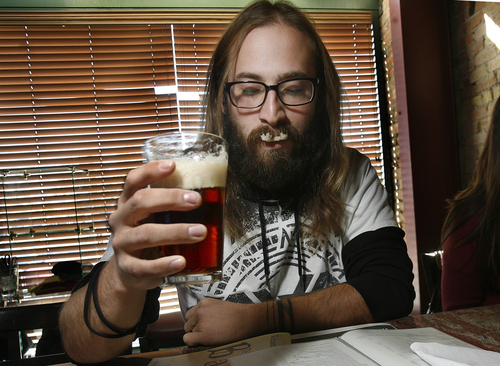 "I do this stuff at home, but I like to see what the local brewers are doing," he said. Turnbow also is a regular at Poplar Street Pub, which offers a new firkin every Friday supplied exclusively by Squatters Pub Brewery. "It adds another dimension to the changing beer scene," said Greg Schirf, with the Utah Brewers Cooperative, which produces beer for Squatters and Wasatch breweries. While firkins are hardly a new invention, they have "been around England for 100 years," he said. "It&apos;s a huge opportunity to be openly creative with beer." Squatters brewer Adam Curfew comes up with all the firkin flavors served at Poplar. Last week, it was Wasatch Polygamy Porter with pumpkin; coming up soon, there will be a beer made with Squatters Wit and fresh peaches. Under Utah state law, only 3.2 beer can be sold on draft. So the Utah breweries make their firkins using only their lower-alcohol beers. One exception is Epic Brewing Co., which recently made 50 high-alcohol firkins to celebrate the opening of its new taproom in Denver  which coincided with The Great American Beer Festival. Some of the offerings at Epic&apos;s 50 Firkin Fiasco included Imperial Red Ale with cocoa nibs, Utah Sage Saison with cracked black peppercorns, Spiral Jetty with chipotle peppers and Imperial IPA with toasted coconut flakes. 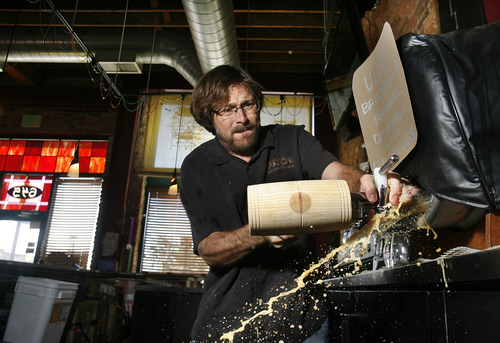 "The fun thing about filling firkins is to take the mother beer and add things to it," Epic brewer Kevin Crompton said. "It&apos;s this beautiful open canvas were I have the creative freedom to do whatever I want." The Bayou • 645 S. State St., Salt Lake City; 801- 961-8400. Every Friday at 3 p.m., the bar taps a new firkin from one of seven Utah breweries: Uinta, Squatters, Desert Edge, Hoppers, Epic, Wasatch and Red Rock. Poplar Street Pub • 242 S. 200 West, Salt Lake City; 801-532-2715. 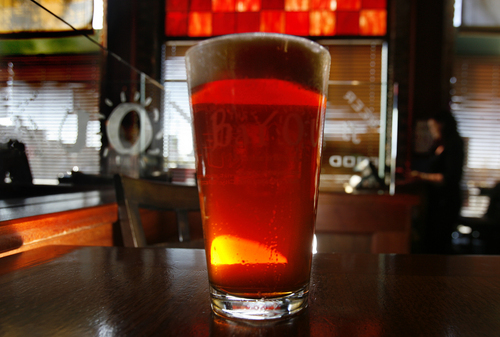 Every Friday at 3 p.m., the bar taps a new firkin from Squatters Brewery.